Welcome! Isn't the Blogger's Quilt Festival just one of the best things? I have discovered so many wonderful blogs and beautiful quilts through the festival and I am looking forward to checking out all of yours. Today I have decided to share my Constellations quilt with you. 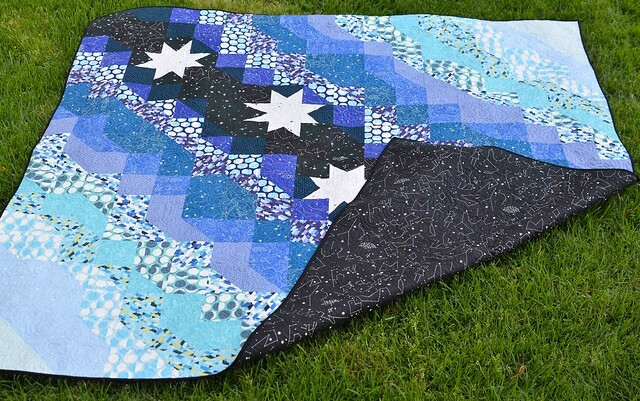 One day I was perusing some fabric online and my husband noticed Lizzy House's Constellations line and asked if I could make a quilt for him. Luckily I was able to track down a bundle (this line disappeared so fast!). My husband supports me as a quilter, but it was exciting to see him take an active interest in my hobby. I wanted to make something special for him and this is what I came up with. I wanted to make the quilt pretty big (it's 80" square) and I wanted to make it unique so I decided to make my own design. 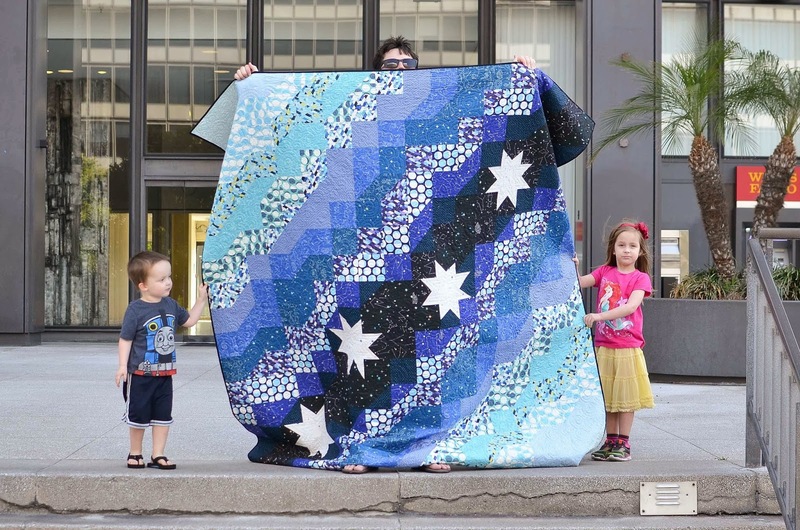 This quilt makes me wish I had an entire bolt of each of these prints, they are so great. Somehow, I missed the original post of this quilt, so I'm seeing it for the first time. I love it! Your design complements the fabric so very well. Well done! I have been wanting to make an 'astronomy like' quilt for about a year but have waffled back and forth the entire time trying to decide what to do. When I first saw the Lizzy House line introduced, I purchased a fat eighth bundle thinking I could do "something". Seeing your quilt is like getting one of those V-8 smacks in the head!! You just outdid yourself. This is beautiful and inspired. Well done!!! this is such a gorgeous quilt, Erica. I just love all the blues. Very cool! It can be so hard to find the right fabrics and pattern for a dude quilt... Glad he's a supporter! Love this quilt, and love the backing! That is such a great design! Looks like a fun photo session. Love seeing this one again, Erica! Gorgeous! I love the festival because we get to see all of these great quilts once again. Love this one Erica! Ahh! This quilt is one of my favorites ever!! 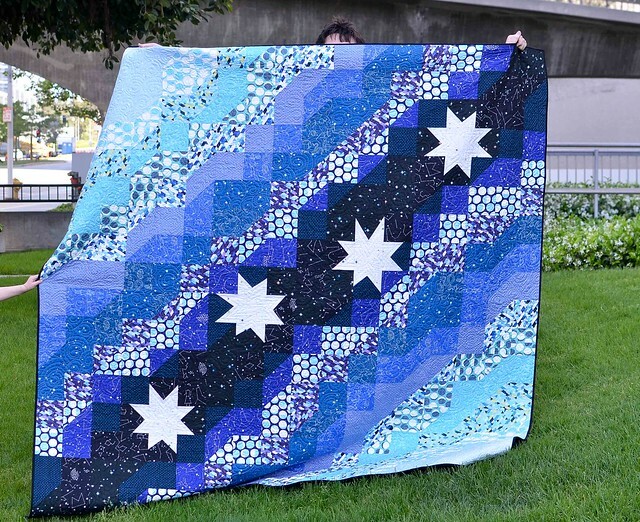 This is a really cool quilt, from the fabrics to the splash of stars down its diagonal! Love the on-site photo, too. (Cute kids!) I always start out feeling awkward going on location with a quilt for photo ops, but it never fails - folks always love seeing it being done. Great shot to have there! Congratulations on a beautiful quilt of your own design! Lovely!